I had the nicest surprise last week: I rediscovered a lost memory of reading. For the past month or so, Marvel’s Fall of the Hulks event (which I’ve been enjoying immensely, certainly more than is reasonable) has had me feeling nostalgic for the classic Hulk stories of the 1960s and 70s–though “nostalgia” is something of a misnomer since I’ve barely read any of those stories! My “nostalgia” is really for the more general Marvel aesthetic of the 60s and 70s, an aesthetic that, in the current Bendis-era (which I do not completely hate, incidentally), I have come increasingly to identify with the Hulk as a character, so much so that the Hulk (the “dumb” one, the melancholy brute, the real one) personifies for me the neo-primitivist poetry of that earlier Marvel age. I’ve written before about that Marvel Treasury Edition that (so I imagined) introduced me to the Hulk at the tender age of six. Published in 1978, it reprinted, among other things, Incredible Hulk #136 (“”Klaatu! The Behemoth from Beyond Space”) and Incredible Hulk #137 (“The Stars, Mine Enemy”), a fabulous Hulk-in-space yarn by Roy Thomas, Herb Trimpe, Sal Buscema, and Mike Esposito that originally appeared in 1971. Seeking out more stories from that era, I bought a copy of Marvel Masterworks: The Incredible Hulk vol. 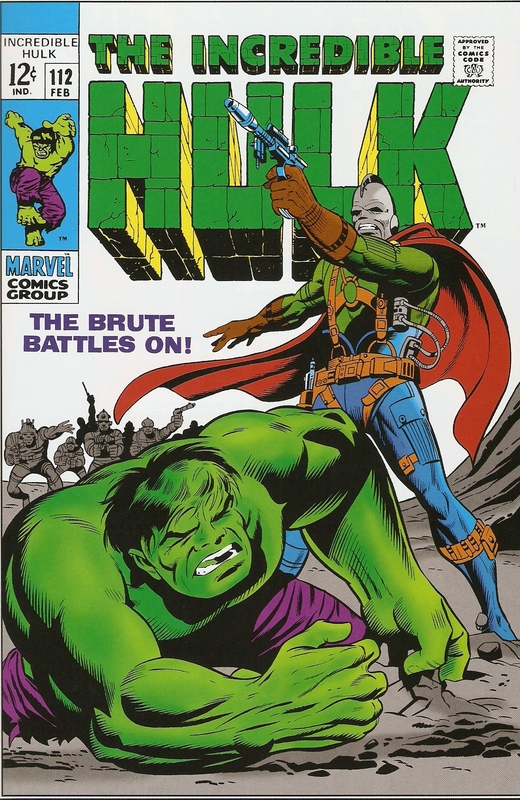 5 last week, which reprints The Incredible Hulk 111-121 from 1969, featuring stories mainly by Stan Lee and Herb Trimpe, as well as the first two issues of Roy Thomas’s run. I sat down to read. Something about the first story, “Shanghaied in Space!” from The Incredible Hulk #111, seemed vaguely familiar, but I couldn’t place it. It was the beginning of a two-parter in which Bruce Banner is kidnapped by a generic alien spaceman who serves the “Galaxy Master,” a low-rent Galactus who manifests as a giant floating Tim Curry mouth suspended in Kirby dots and snarls Stan Lee-isms. Where had I seen this before? And then I turned to part two, “The Brute Battles On!” from The Incredible Hulk #112, in which the Hulk and the Galaxy Master throw down. From the very first page I felt that uncanny prickling on the back of my neck, that certain quiver in the chest one feels upon opening an attic box to discover a stash of crinkled valentines, long forgotten. It took several pages for me to be sure. It was the image of the blue cyclops with sledgehammer fists on page four that clinched it. This was my first Hulk comic. And it was a Hulk-in-space story, too! No wonder I was so taken by the Roy Thomas/Herb Trimpe “Klaatu” saga that I found, the following year, in Marvel Treasury Edition #20. Of course, I had not read the original Stan Lee/Herb Trimpe “The Brute Battles On!” issue from 1969. I don’t think I ever actually owned a 12-cent Marvel comic back then! I must have read the reprint of that comic, which appeared in Marvel-Superheroes #66 in September of 1977. This was, of course, also the golden year of Star Wars, which had hit theatres in May and which I had seen in an Edmonton theatre that summer. Even allowing for the strange gap between cover dates and actual dates on Marvel and DC comics, it seems likely to me that my six-and seven-year-old attraction to these Hulk-in-space tales owed a great deal to George Lucas. What a wonderfully knotted formative moment in time this was: 1977. So many of my later obsessions intertwine here in nascent form, awaiting my adolescent and even adult discovery of those writers (Vance! Davies! Lovecraft! Kristeva! Deleuze!) who would articulate them, spin them out, be adequate to their strangeness and implication, make them visible as forms, as jewels snared in the spider’s web of representation. I’m planning to revisit The Incredible Hulk #112 more than once in the coming weeks. In the meantime, I’d be grateful for any suggestions you might have for further reading. What ARE the greatest Hulk stories of the 1960s and 70s? What should I read next? I’d love to hear your thoughts. One of the many pleasant character pieces to come out of Blackest Night is Denny O’Neil & Greg Rucka’s The Question #37, a revisiting of O’Neil’s Zen-themed The Question series from the late ’80s. Like that eariler series, this issue is drawn by Denys Cowan, whose wonderfully scratchy pencils are inked by The Question‘s old cover artist, Bill Sienkiewicz. Although nominally part of the longer Blackest Night tapestry, this story is a genuine bookend to both the original series and Rucka’s sections of 52, while at the same time reading smoothly as a stand-alone issue. It is one of my favourite single issues of the past few years. I’ve read and reread it several times over the past couple of weeks, and I will read it many more times I’m sure. At its core, it is a marvelously simple idea, deftly executed. The story unfolds on a dark and stormy night. (Don’t be put off by the cliche; in a move that can only be called elegant, O’Neil and Rucka refashion the compulsory “Blackest Night” framework into a metaphor for the “long dark night of the soul” that follows for at least one of the main characters.) Charlie’s old friend ‘Tot awaits the Question’s resurrection as a Black Lantern, hoping that an undead Charlie will help him unlock the mysteries of death. 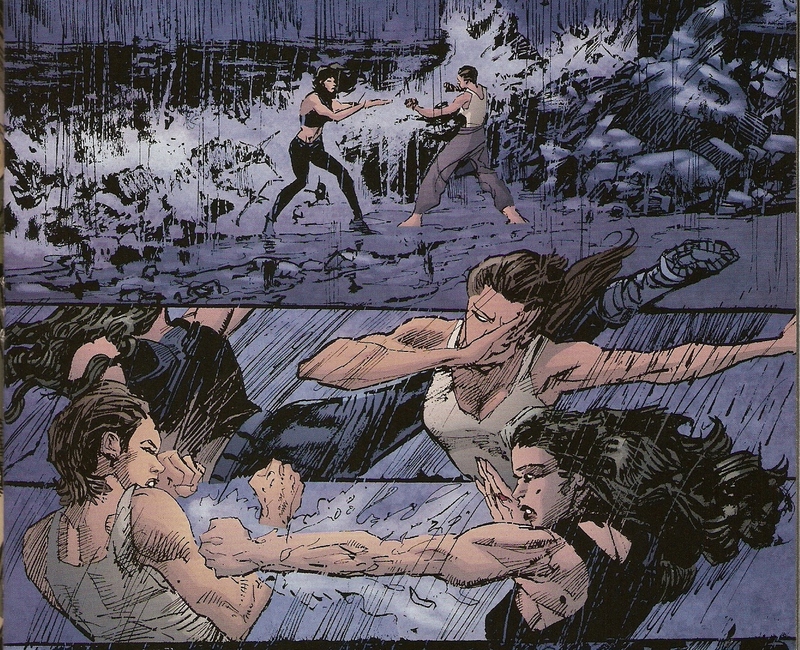 Meanwhile, Lady Shiva appears at ‘Tot’s lighthouse to test new Question, Renee Montoya, in a martial arts throwdown on the beach. As expected, Charlie returns as a puppet of the Black ring to attack his successor and Lady Shiva. The crux of the battle [spoilers ahead] is that since Black Lanterns can only “see” auras comprised of their objects’ emotions, the solution to evading them (though perhaps not to beating them) is simply to “feel nothing,” Zen-master-style. Thus does Lady Shiva will herself to “disappear.” And so, too, Renee Montoya. 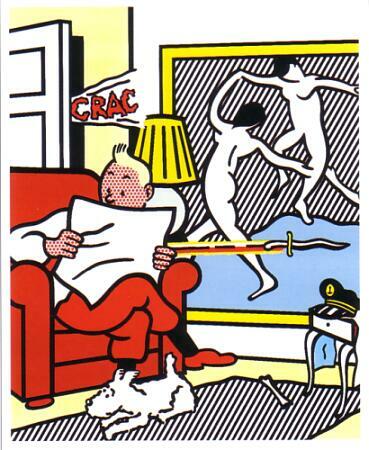 But the real disappearing act–the one that matters here–is ‘Tot’s. For it is ‘Tot who has–so the narrative might be taken to imply–garrisoned himself against the pain of mourning by reducing the emotional significance of Charlie’s “resurrection” to a scientific opportuinity. “Say goodbye to him,” Montoya councels ‘Tot, as she disappears into meditative invisibility and the Black-ringed Question turns on his former partner. 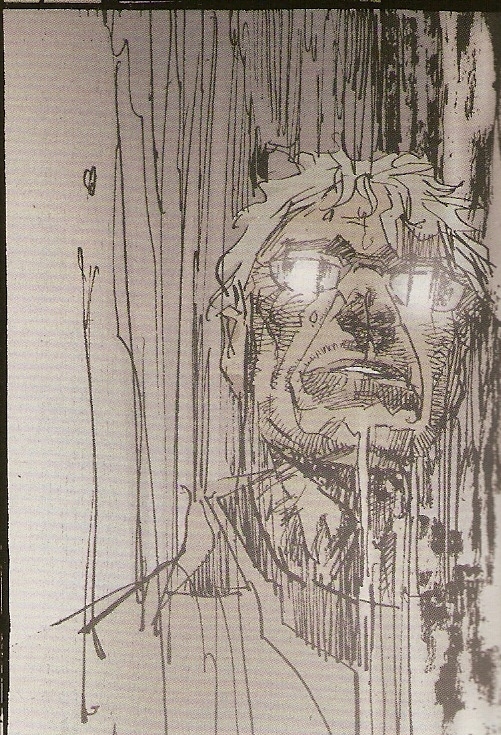 The story is thus primarily about the necessity of mourning, of overcoming the fear of facing loss (‘Tot’s aura is yellow as he fades and says “…goodbye…”). It is a moving scene in a comic whose visual tonality is, so to speak, pitch-perfect. Needless to say, I have started rereading the original series, which I haven’t picked up for many years. Too long.